In the past couple of years, we have seen a great increase in the number of binary options trading platforms and software programs. There are many reliable systems that can earn you a decent amount of money, but there are also some that are fake and will simply steal your investment, along with your credit card information. You need to take the time to read some reviews before you invest your money with a trading platform. We have made it our mission to provide our readers with honest reviews about the newest binary options trading systems. In the following, our Make Money Robot review, we shall give our honest and unbiased feedback regarding this trading software. Read on to find out if this system passes the test or is simply another sham trading system. What is Make Money Robot? Michael Williamson, the creator of Make Money Robot, claims that this trading system is the cream of the crop. 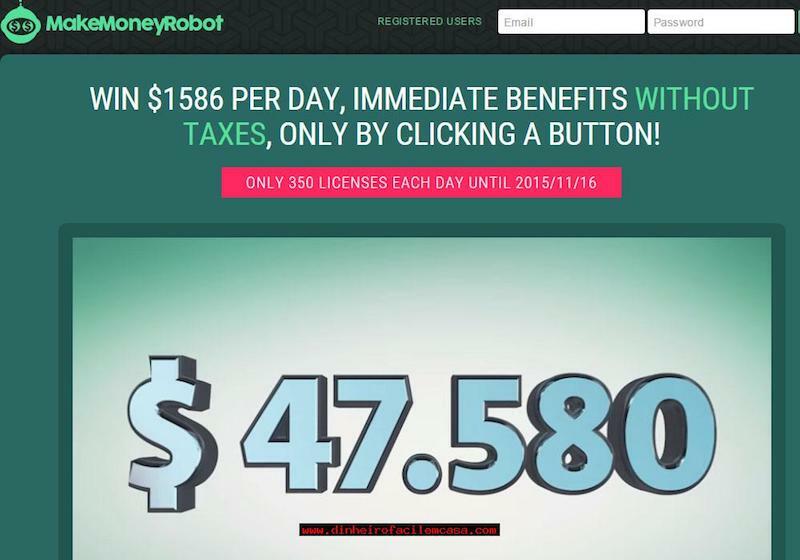 According to Williamson, Make Money Robot can earn traders $1,586 a day every day for life. This would equal around $570.960 per year. However, Williamson neglects to mention that in order to earn this kind of profit with any trading system, you must be willing to invest a great deal of money upfront. You cannot earn this kind of money with just a minimum deposit. Also, Williamson does not elaborate as to how his Make Money Robot System actually operates. We are not provided with any information on the website nor in the sales video does that explain how this trading software analyzes its data to predict winning trades. We find this a bit misleading. To sign up with Make Money Robot, you must create an account and sign up with one of the brokers recommended by the system. The system is free for 90 days; however, after that time you must pay a regular ongoing fee with your designated broker. We found that the brokers who are associated with Make Money Robot are not regulated by any governing system. This means they do not have to follow any of the codes that are set forth by regulating systems such as CySec. We do not advise that you trade with any brokers that are not regulated as they usually cannot be trusted. If the system earns you any type of profits, you may then withdraw your funds. However, during our review, we learned that the majority of traders who have signed with the system did not earn any profits whatever but rather lost all of the money that had invested with their brokers. Final Conclusion: Is Make Money Robot a Scam? We cannot say for sure that Make Money Robot is a fraudulent trading system at this time. However, we do not recommend it as a safe and reliable trading option. We feel that you can make better use of your time and money with another system that has a solid reputation and proven results. We find the lack of inflation to be a bad sign, as well as the numerous complaints from other traders who have traded with this system. The fact that no one has actually earned a decent profit with this system is very discouraging. 7 Binary Options review: Make Money Robot: 1 stars. Thanks for the information. Staying away from Make Money Robot!